SAN JOSE, Calif., Oct. 09, 2018 (GLOBE NEWSWIRE) -- According to a new market research report published by Credence Research “Bulk Material Handling Equipment Market (by Equipment Type: Stacker, Reclaimer, Stacker Reclaimer, Band Conveyor, Bucket Wheel Excavator, Stripping Shovel, Rope Shovel, Bucket Elevator, Ship Loader, and Bucket Crane; by End-user Industries: Mining, Construction, Industrial Manufacturing, Port & cargo Terminal, and Packaging) - Growth, Future Prospects, and Competitive Landscape, 2018-2026”, the bulk material handling equipment market was valued US$ 38.29 Bn in 2017 and estimated to grow with a CAGR of 4.5% during the forecast period from 2018 to 2026. Continuously growing population instigated the never-ending process of demand and supply system. Processes such as extraction of natural resources, construction of infrastructures, manufacturing, packaging and cargo transportations are no exception to the scenario. 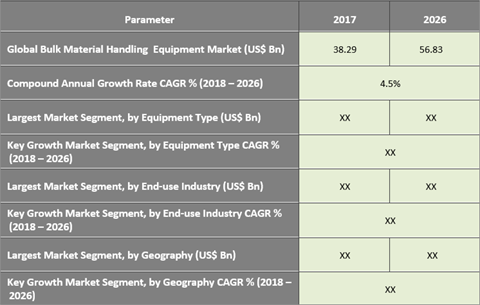 The growth in aforementioned sectors is considered as the most vital factor for the growth of bulk material handling equipment market. The equipment used under bulk material handling section evolved in great deal with respect to design, functionality, and efficiency helping several end-use industries and especially mining and construction industry. The equipment aided mining industry to uplift themselves from being the most inefficient industry. Similarly, rapidly expanding construction industry are also heavily dependent on such equipment. Consequently, growth construction and mining sectors encouraged the procurement of bulk material handling equipment and resulted in growth of the market. In addition, growing number of ports & cargo terminals and packaging industry are playing a major role in driving the industry to a notable market value. At present Asia Pacific is at the top of the podium thanks to contribution extended by the developing economies including China and India. China represents as one of the most prominent states in world trade and is at the center of global mining map. Consequently, it represents itself and Asia Pacific as one of the lucrative markets in bulk material handling systems market. Other countries including India, Japan, and Australia extend their vital contribution to the market. The market in Asia Pacific projected to retain its dominance throughout the forecast period from 2018-2026. However, high cost of procurement and services are causing hindrances in the growth of bulk material handling equipment market. Competition in bulk material handling equipment is no less than clash of titans as the players in the industry are some of the biggest across the globe. The face players are confronting each other in this sluggish market to maintain their supremacy. Several strategies such as long terms contracts, partnerships, and acquisitions have been adopted by these companies besides expanding their geographical presence. Some of the most prominent players profiled in this research study include Komatsu, Metso Corporation, TRF Ltd., ThyssenKrupp AG, IHI Transport Machinery Co., Ltd, Hitachi Construction Machinery Co., L&H Industrial, Voith GmbH, Tenova S.p.A,, Techint Group, Kawasaki Heavy Industries, Ltd., and Sumitomo Heavy Industries Material Handling Systems Co., Ltd., among others.